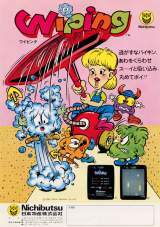 Wiping © 1982 Nichibutsu [Nihon Bussan Company, Limited.]. Wiping was released in September 1982. This game was updated one year later as "Rug Rats" (see this entry for difference). Clearing a square of floor : 10 points. Frozen Baddon : 800 points. Frozen Bilbola : 1,000 points. Frozen Bigimba : 1,200 points. Killing 1 Monster With Carpet : 1,500 points. Killing 2 Monsters With Carpet : 3,000 points. Killing 3 Monsters With Carpet : 6,000 points. Killing 4 Monsters With Carpet : 10,000 points. Last Monster : 3,000 points. * Try to group the monsters together, and lure as many as possible at once behind you on to a carpet for big points (10,000 for 4 monsters). * Remember the positions of the four bonus items when the level starts, as collecting all the items will stun all existing monsters - and killing all the monsters when stunned is worth a lot of points. * At the early parts of each level, concentrate on killing the monsters singly, clearing a path into their territory and waiting around a corner to stun them. * When the monsters start homing in on you, move to a large safe area away from them and then make your way to a carpet, waiting for as many monsters as you can. 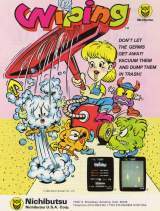 Wiping was developed by game developer company Jorudan.